I am the Managing Director & Specialist Private Investigator for Pathfinder Investigations Pty Ltd. I founded the company in May 2013 in Perth, Western Australia. 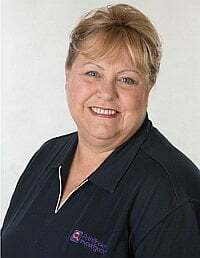 My credentials can be verified by going to the WAPOL Current License Holders page where you will find me listed under my married name of “SMEULDERS, JANINE” on the Inquiry Agent’s list (IA 45735) and Investigator’s list (IN 45735), both of which are updated monthly. 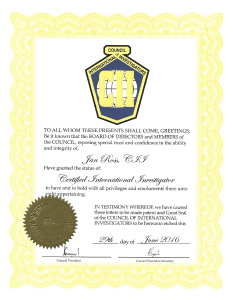 I am a former Member of the Council of International Investigators and have over 600 contacts in 155 countries covering all 60 aspects of investigation, including Asset Tracing, Due Diligence, Risk Management and Process Serving. 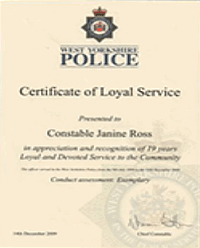 I gave Loyal, Devoted and Exemplary service to the community in West Yorkshire Police, England, from 1990-2009; operating in town, city and rural environments, and qualified to Sergeant. 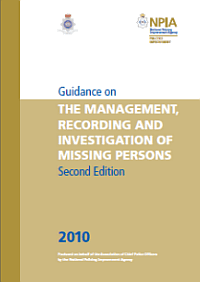 Missing Persons: In 1998, I realised that the Police were not investigating Missing Persons correctly, leaving the public feeling let down, and began instigating improvements which subsequently became UK national policy on how to find missing persons more efficiently and effectively. In 2004, I was the first officer in West Yorkshire to be dedicated to dealing with such investigations on a daily basis, and for training all my colleagues in my area. As a result, my team had a 100% success rate for solving current cases over a 5 year period, saving the taxpayer $7 million a year. I regularly reviewed cold cases, which can be see on our Are You An Armchair Detective page. By spearheading a multi-agency approach, much-admired by senior detectives across the country, I had significant success in preventing drug addicted sexually exploited teenagers from regularly going missing from home and school. In 2001, I was awarded a Divisional Commander’s Commendation for Distinguished Service “In recognition of the tenacity, enthusiasm and commitment she displayed in an investigation in the arrest and conviction of two prolific criminals” who had committed 40 offences of theft, deception, burglary and robbery across four counties in the north of England. Whilst much of my work is Process Serving, having traced my own family tree back to 1677 (which was great fun! ), my main passion is tracing Missing Persons and Beneficiaries. Whilst it’s not healthy for some relationships to continue, hence the Family Law work, I do get a lot of job satisfaction re-uniting families. Licences held by Pathfinder investigators entitle them to conduct inquiries anywhere in Western Australia, an area of 2,529,875 square kilometres, which is approximately a quarter of the size of the USA or over 10 times bigger than the UK!